Large, open, evergreen shrub or small tree. 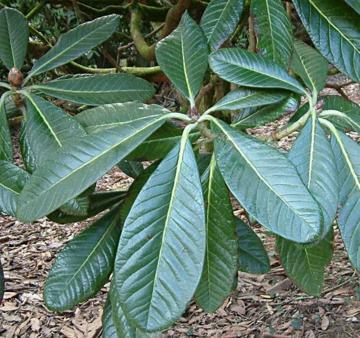 The largest leaves of any Rhododendron species, up to 75cm long, dark green with a silver or buff indumentum underneath. Large trusses of creamy yellow flowers with a crimson blotch inside, April to May. Sheltered location with lime-free soil. Architectural specimen for large woodland gardens. From China and Tibet. Discovered and introduced by George Forrest in 1913.